In September/ October 2018 I embarked on a 2-week residency at the buzzing We The Curious science centre in Bristol. My mission was to explore the metaphorical forests in our brains, made up of pyramidal neurons that look like tree structures. I also wanted to find out more about the forests in our minds, the ones we remember and imagine, the personal stories. The process was informed by research on visual imagination in Neuroscience, on plant signaling as well as the symbology of forests. I offered workshops for families/ children of various ages and for grown-ups. During these workshops, participants were approached to share the unique images in their minds to do with trees and forests. 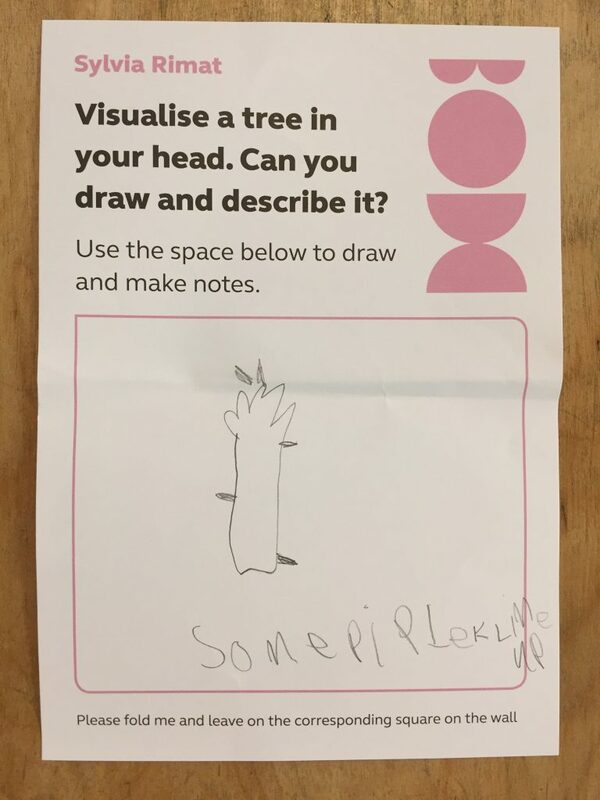 Through visualisation exercises, a great wealth of personal drawings and notes were collected that turned out to be poetic, captivating and sometimes quite unexpected… one participant came up with a giant snow drop as a tree! I liked this visitor card so much that it inspired me to change the title for the project, that started out under the name ‘Tree’ (based on an original concept created with Cat Jones) and had continued as ‘Dendrites’. So the new title now reads ‘Some People Climb Up’. The next stage will see me develop an audio walk through a forest. I’m not sure if people will actually climb up the trees but let’s see. A few weeks ago in March, Sydney-based artist Cat Jones and I embarked on a 2-week residency at Big Ci in Bilpin, New South Wales, Australia to explore our working collaboration and make a start on our brand new project Tree. I’m really excited about Tree! The project delves into the depths of our imagination, drawing on Neuroscience, plant signaling, the symbology of forests and on our very personal imagined stories, related to the woods. Once finished, it will take the form of a site-specific audio walk through a forest and lead to a book project published alongside. Big Ci was a perfect location for making a start on this work, tucked away in the scenic Blue Mountains, surrounded by bushland. We were taken on an introductory walk, to get to know the local landscape and tree species and worked alongside other (inter)national artists in a spacious studio. Before and after the residency, I travelled to Sydney, to Melbourne and to Launceston and Hobart in Tasmania, to meet up with festival and venue producers and peer artists. Cat and I have already been invited for the next 2 -weeks residency in March 2018, to develop Tree further. This residency will take place at Arts House in Melbourne and is funded through a Culture Lab commission. I can’t wait to return to Australia! The trip was kindly supported through the Arts Council’s and British Council’s Artist International Development Fund. Over January and February 2017 I’ll tour my performance This Moment Now to a few places in Britain. We’ll start off with a run of five shows as part of The Yard Theatre’s NOW17 Festival in London. The festival will also feature Greg Wohead and Rachel Mars, Deborah Pearson, Mamoru Iriguchi and Rachael Young amongst other. I’ll be double billing with emerging artist Richard Dodwell and his evocative performance PLANES. Later in February we’ll travel to Colchester Arts Centre and to Theatre Fest West at Salisbury Playhouse. This Moment Now is a playful exploration of how we perceive time, as individuals, as audiences in a performance and on a wider scale, considering various concepts of time. Inspired by conversations with specialists from mathematics/ physics, philosophy and people of different ages. The tour will be accompanied by a number of workshops for elderly and young people, with a focus on time and ageing. So far we’ve been on tour to ICIA Bath, Chelsea Theatre London, Chichester Showroom and Cambridge Junction. Supported using public funding by the National Lottery through Arts Council England. Commissioned by ICIA University of Bath. Further support by Joe Allard Commission, Institute of Physics, Cambridge Junction, Chelsea Theatre, Bristol Old Vic Ferment, Arnolfini and Residence. I am very happy to announce that my brand new performance This Moment Now will premiere on Thurs, 30 April 2015, at the Institute of Contemporary Interdisciplinary Arts at University of Bath. In this show I set out to playfully explore how we perceive time, as individuals, as audiences in a performance and on a wider scale, considering various concepts on time. A drummer, a stage manager and a secret guest become the protagonists of the show, which focuses on rhythm, movement, video interviews and the liveness of facetime. A woman in her nineties dances to the camera, a young girl of eight talks about being fast at doing the splits and cups of teas help the audience to overcome a pause. This Moment Now is inspired by conversations with specialists from mathematics/ physics, philosophy and people of different ages. Commissioned by ICIA University of Bath. Supported using public funding by the National Lottery through Arts Council England. Further support by Cambridge Junction, Chelsea Theatre, Bristol Old Vic Ferment, Arnolfini and Residence. I am very delighted to take part in Proximity Festival in Perth, Australia in autumn this year. Taking place at Fremantle Arts Centre from Wednesday 22 October – Saturday 1 November, the 2014 program will present twelve unique intimate experiences for one audience member at a time, created by artists from the United States, United Kingdom and Australia. I will develop the one on one performance Dance With Me, working with voices via headphones and drawing on Fremantle’s history as a ‘Lunatic Asylum’ in the late 19th/ early 20th century. More info about the festival can be found here. Tickets and program details will be released in August. Itâ€™s now less than three weeks until I will be performing as part of the British Council Edinburgh Showcase at Summerhall and I am starting to get really excited!! To support my showings up in Edinburgh Iâ€™ve started a crowd-funding campaign. In order to perform six times, I will have to pay for a stage manager, a technician, space hire, travel expenses and accommodation, technical equipment, marketing, fees for external performers live via skype connection and for FRAGGLE, the Scottish Eagle Owl which will be performing alongside me. And FRAGGLE will be lovely for sure but he doesnâ€™t come cheapâ€¦. On Monday 25th March 2013 I will be showing excerpts of my new performance ‘If You Decide To Stay’ in form of a lecture performance, at the Graduate School of Education, University of Bristol. The show is informed by conversations with specialists from Neuroscience, Mathematics, Experimental Psychology, by a Psychotherapist and an Astrologist. In a conversation with Dr. Paul Howard-Jones, Reader in Neuroscience and Education, the idea came up that this lecture performance could, in return, inspire formal research. The lecture performance will be followed by a workshop, facilitated for researchers and students. We will start with creative exercises and explore ideas based on my interdisciplinary approach for developing this performance. We will focus on how performance may inspire experiential research, help capture data from others and help disseminate findings. I am very curious to see what will be coming out of this, it’s a real experiment…..